Lonely Kaliningrad could become the model for constructive dissent; opposition activists are cautious but say they are starting to be heard. Kaliningrad gave the Kremlin a wake-up call when opposition groups staged anti-government rallies this year, drawing thousands of people to its central square to protest exorbitantly high taxes and duties and cuts in programs. Opposition leaders complained bitterly and openly of United Russia and the region's increasingly unpopular governor. Some say that the protests have led to change, and even a sensibility of openness to the place. Could a Kremlin-appointed governor feel an increasing sense of duty to his constituents? Not long ago, a BMW X5 driven by a local businessman hit a young man on a Kaliningrad crosswalk. The region’s controversial governor, Georgy Boos, was passing and, to the surprise of eyewitnesses, the motorcade stopped and the governor got out of his car and called an ambulance. He found himself in a situation familiar to thousands of Russian citizens: He was referred from one operator to another and asked to hold. He called his health minister, Yelena Kluykova, who did not answer his call. Finally, after half an hour’s wait in freezing weather, the bleeding victim was picked up by an ambulance. The health minister was fired shortly after the incident. Opponents claim that it was a publicity stunt worthy of reality TV, but others say there is a kindler gentler Boos. “The authorities changed their behavior after the protest rallies,” one bystander said. Nearly five years ago, the Kremlin sent a young and ambitious businessman close to Moscow Mayor Yuri Luzhkov to govern the area. Kaliningrad was a wild and neglected frontier. The region, known as Russia’s western outpost, was rocked by corruption scandals and problems after the introduction of Schengen visas in neighboring European Union countries. “Before 2004, we traveled freely to Poland and the Baltic countries and getting a visa was no problem," said one regional official. The area was not considered part of Europe, yet it was cut off from mainland Russia. Meanwhile, the economy was stagnating despite the region’s many privileges and status as a special economic zone. Since the riots, a cautious optimism has followed on the heels of revitalization efforts and concessions to the opposition. 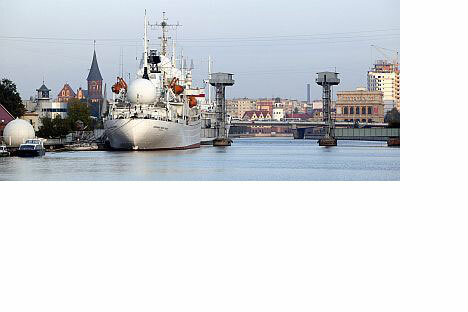 To this day, Kaliningrad has a strong sense of belonging only to itself: Before World War II, the area was a part of Germany called Eastern Prussia, with the capital named Koenigsberg. In 1945, Koenigsberg fell to the Soviet Army. At first, the Russian authorities paid scant attention to the region. In the tumultuous 1990s, there was a movement to return the region to Germany and rename it Koenigsberg once again. Perhaps in honor of its Germanic roots, Boos started his term as governor by building a modern autobahn. Well-lit, smooth and utterly European, it is a section of the future $300 million Maritime Ring, which should one day link Kaliningrad with the beach holiday resorts in the west and north of the region. The highway, which has now nearly reached Zelenogordsk, is probably the best road in the country. Locals grumble about the highway. “We don’t care if the drive to the seaside takes 20 or 40 minutes. We are more concerned about traffic jams in the city,” said Solomon Ginsburg, an opposition deputy in the regional parliament. The road is the governor’s most tangible achievement. Ambitious plans to build a luxury marina on the Baltic coast and a Formula One racecourse remain on the table, while other initiatives were wrecked by the crisis. Indeed, it was the crisis and the way the authorities handled it that brought thousands of people into the streets in January to demand the resignation of Governor Boos and Prime Minister Vladimir Putin. The protests were triggered by the increase in housing and utility rates, and a rise in the transport tax. Konstantin Doroshok, leader of the movement Justice and rally organizer, once made a living by bringing in second-hand cars from Europe. He was politicized four years ago when Doroshok and other small businessmen faced outrageous tax claims. The final blow to his business was dealt by the prohibitive import duties slapped on used cars that the federal government introduced during the economic crisis, mainly to shore up the beleaguered Soviet-era dinosaur AvtoVAZ, the maker of Lada. In a city where official income is quite different than one's unofficial income, Vitautas Lopata is said to be the only person who pays the state everything he owes. “I joined the opposition because I was fed up with inspections. The former mayor did not allow cafes to be built,” Lopata lamented. “So I decided to go into politics to defend the rights of businessmen like myself.” Asked how he manages to pay his taxes without killing his business, he said that he cannot expand the business, hardly ever takes a holiday and can’t buy a new car. Almost all of the region’s German population left after World War II. In order to avoid being sent to labor camps, the reamining German women had to pass themselves off as Lithuanians or Estonians. The last of them, Frau Marta, died in Kaliningrad two years ago, we were told at the German-Russian House. The latest census puts the number of Germans in the area at 800. One of the most symbolic landmarks in Kaliningrad is the House of Soviets, a huge monument to Soviet constructivism, which has never been finished. Before 1967, the palace of the King of Prussia, which had survived World War II, stood on the site. Kaliningrad’s monument to communism was never finished. The huge House of Soviets was abandoned and now its foundation is cracked and the building is on the brink of collapse. Lopata and other opposition members admit that the governor has changed since the rallies, however. “While previously he thought only about mega-projects and ignored criticism, he now regularly meets with the opposition, has become aware of everyday problems and reacts to our ideas,” Ginsburg said. The opposition’s original demands have been met: the transport tax rise has been revoked and utility rates have been declining. The question remains, though: What will drive the region’s growth? Tourism could provide part of the answer, but the industry is in need of a major revamp. The best-known holiday resort in Soviet times was Svetlogorsk, where a creaky elevator takes one from the city’s beach to the high Baltic shore for less than a dollar. To the north lies Kurskaja Kosa, a UNESCO nature reserve, with sand dunes that mirror a desert landscape and strange, twisted trees reminiscent of modern art known as the “dancing forest.” In the 1990s, the sandbank was developed chaotically and is woefully short of tourist services. Of all the roadside cafes, only a small stall is open in April. Its owner sells potato chips past their sell-by date and suspicious-looking shashlik. “There is a lot of room for tourist development,” said Alexander Blinov, the mayor of the town of Yantarnoye (Amber). He started his tourist project from scratch. Five years ago, Yantarnoye was mainly known for its amber quarry, the prey of looters. Now there are signposts everywhere directing visitors to landmark sites; German houses are restored as a hotel is being built. “We promote tourism and hold various festivals and sporting events, which attract a constant flow of tourists. We provide the best possible environment for investors,” Blinov said. Of course, a lot of work remains to be done. The state of the Poseidon diving club makes drowning look like a pleasant alternative. But a viable holiday resort could well be in this outpost's reach. Why have social conflicts arisen in the Kaliningrad Region? This is a perfectly normal phenomenon for any democratic society. And it shows that the inhabitants of the Russian enclave are taking an active position on life and possess a high degree of civil self-awareness. The outbreak of this kind of activity is also a result of external post-crisis factors: a reduction in the standard of living as a consequence of the recession against the background of a rise in certain taxes and utility charges. Have you succeeded in dealing with the protests? One of the main lessons from the mass meeting for me is that we need a new format for dialogue between the authorities and society. This is already happening. One new form of communication with residents is the regional TV channel’s live video link. I have already received more than 1,500 appeals from various parts of the region, some of which I have been answering for four hours and the rest of which have been sorted and will definitely receive a reply. Founded in 1999, Gazeta.ru is Russia’s most widely read and popular internet publication with a monthly readership of 6.5 million.